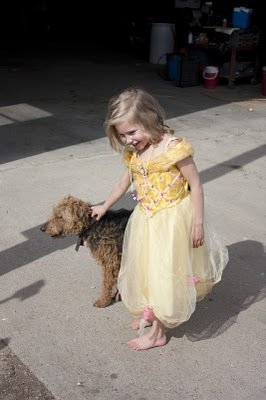 We promised the girls when we moved to the farm that they could get a dog or two—eventually. It was just too much to take on right now with a new baby, so we told them they would have to wait. Actually, we have plenty of dogs around already. The dog on the left is Polly. She belongs to my Mom and Dad. Polly came from a litter that belonged to Tom's parent's old black lab and golden retriever, and Tom and I surprised my parents by bringing her up one Easter weekend when we were newly married. 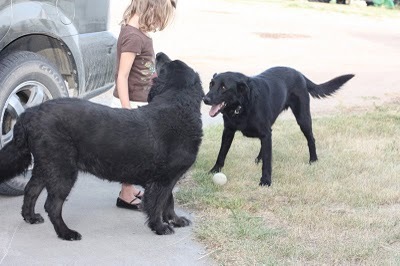 The dog on the right is Sammy and he lives at my Uncle Bob's a mile down the road. Whenever they leave home he comes over to visit. I don't mind seeing him come around once in awhile as I am very entertained by how smart he seems to be. And finally, this is Belle. (Coincidentally being led around by Sarah dressed as Belle). She belongs to my Uncle Darrel, who brings her out with him when he comes to work. You may know her as the sandwich thief suspect. At least now we know Sarah loves dogs!